Our dash cam setup guide has been created to help you better manage the wires when setting up your camera, and is the first in our “How To Set Up A Dash Cam” series. 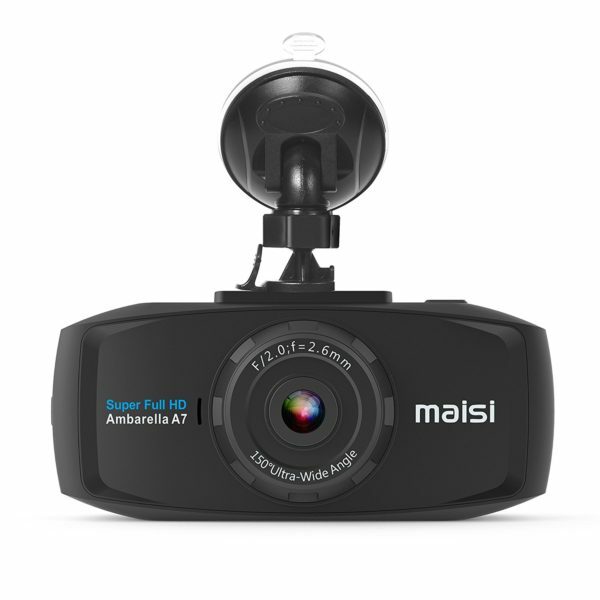 There are many different methods for setting up your dash cam, each with their own advantages. The method I will be sharing in this guide is the fastest, and requires no additional tools or knowledge. 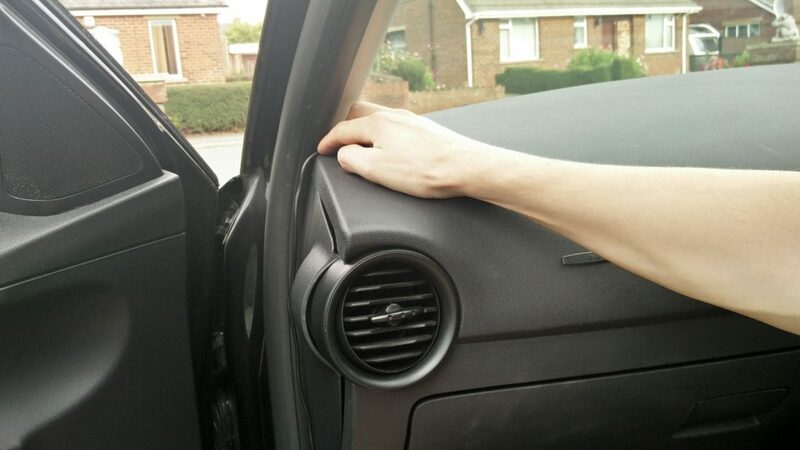 However, you may want to invest in some self adhesive cable mounts, if you wish to route the wire around the airbag. 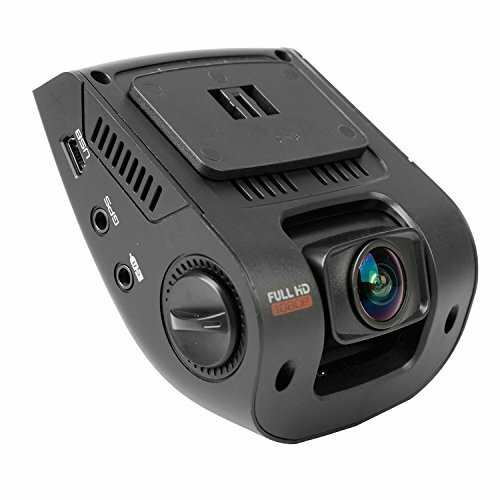 If you wish to hardwire the dash cam, I suggest watching this video, as hardwiring is too complex to explain in this article. This will require removing the A pillar to take the wire down to the fuse box, and requires purchasing an additional kit. 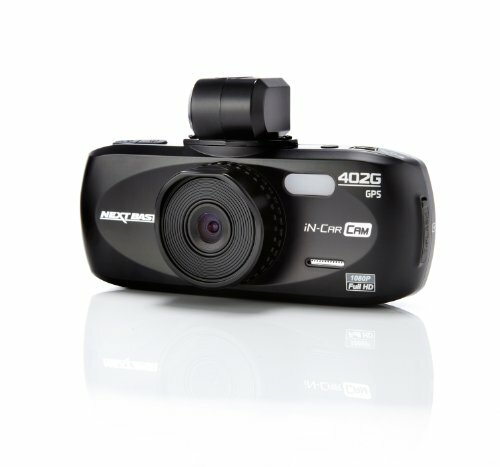 The Power Magic Pro for BlackVue dash cams is a good reliable choice, and is compatible with all BlackVue models. Just click the bold text to find these on Amazon. 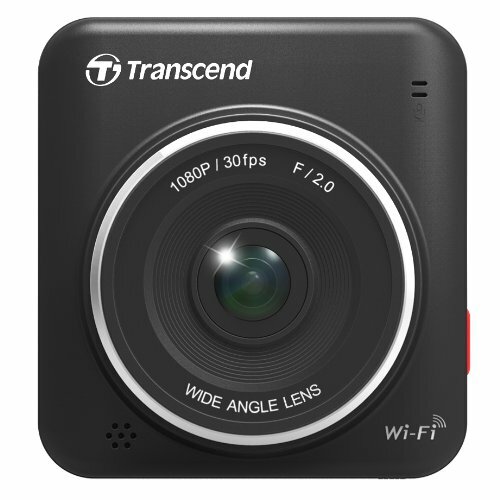 A cheaper alternative is the Nextbase Hard Wire Kit, compatible with most Nextbase Dash Cams . 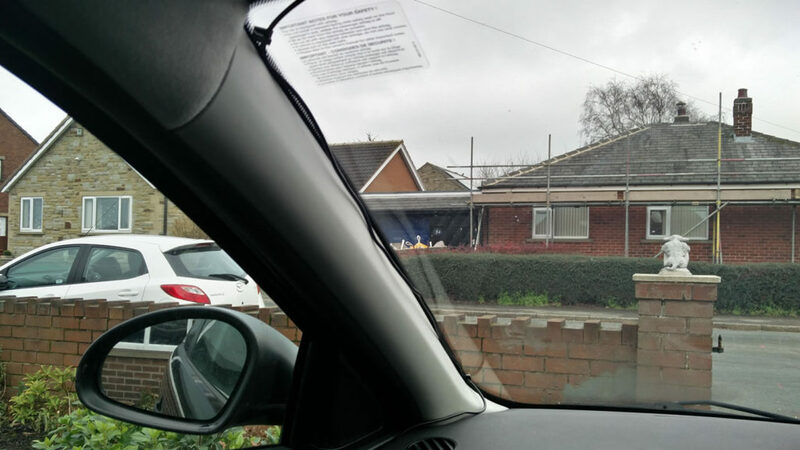 If you want your dash cam hardwired, I strongly recommend visiting a professional, Halfords can usually do this. Warning: There is a debate going on regarding dash cam wires and the deployment of airbags. Some people claim the wires may be pulled out and flung around if a collision was to occur, creating another hazard for the driver. For this reason I am giving you two choices. I’ll provide more information when we get to this section, but if you wish to avoid the airbag you will need cable mounting clips. 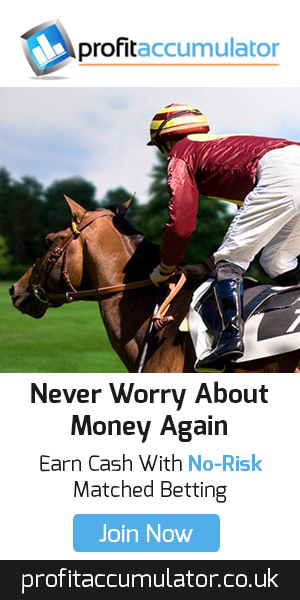 You will need to make this decision for yourself, I can’t recommend one way or the other. The red line below demonstrates where we are aiming to route the cable. 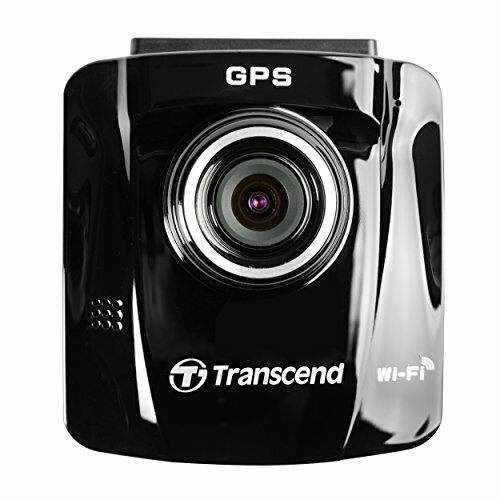 To begin you will need to attach your dash cam to the windscreen, with either a suction or adhesive mount. The best place for this is near the rear view mirror, preferably on the passenger side. Remember to leave enough room at the top for the USB cable, as some dash cams such as the Rexing V1 require more space. 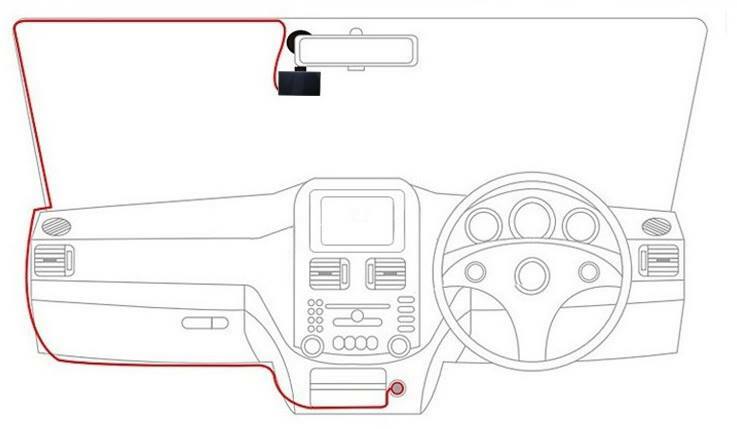 Now you need to plug the USB cable into the dash cam, and take the wire towards the top of the windscreen. 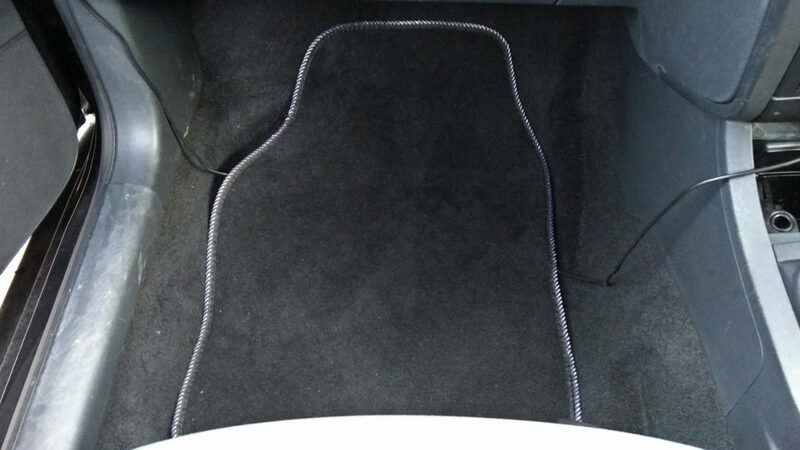 Tuck the cable between the windscreen and headliner fabric (see image below), keeping it fairly tight. In some vehicles you may need to use some tape to keep this wire from falling down, but in most cases it should stay up by itself. 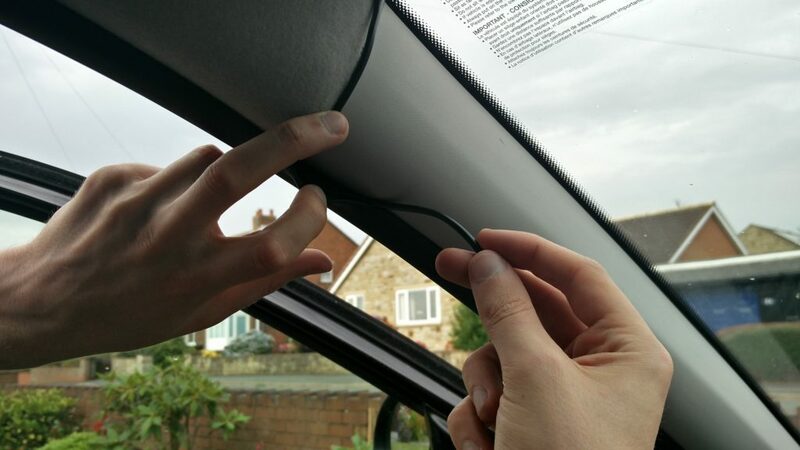 An alternative to using tape is sticking cable mounting clips on the top of the windscreen, to take the wire along. Just make sure there is no moisture, as this will cause the clips to fall off. After you have taken the wire along to the door, you will have two options. The first is to route the wire across the A pillar. You can peel up the rubber on the other side, and neatly tuck the cable underneath. This option is quick and easy, and doesn’t require additional equipment. However, many cars have an airbag underneath this pillar. When this is deployed, the panel should swing towards the windscreen. Unfortunately I couldn’t find any tests involving airbags and dash cam cables, so I can’t confirm what would happen after this. The wire may be pulled out and flung around, or it may stay relatively out of the way. If you are going to take this option, I would recommend taking the wire above the panel (not over like in the image below) just in case. 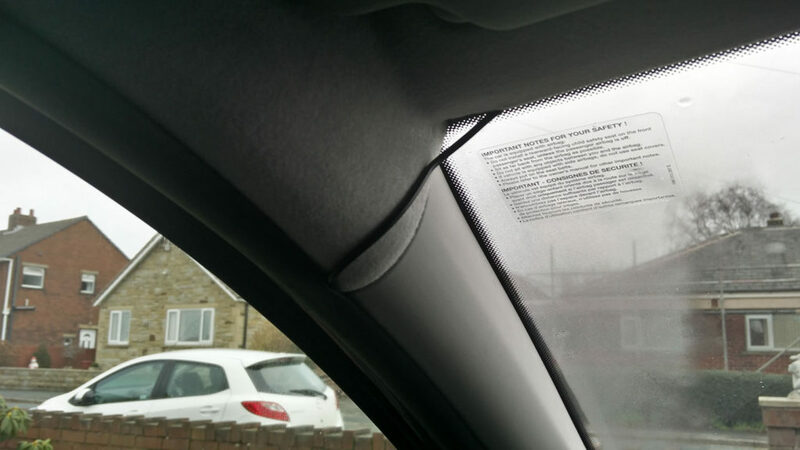 The second option is to take the cable down the side of the windscreen, to avoid the airbag. To do this you can push the wire in to the side as much as possible, before sticking it down with tape. An alternate method is to use cable mounting clips. Start with one at the top, and one at the bottom (remember to clean and dry the windscreen). If the wire is loose or untidy, add more mounting clips in between. 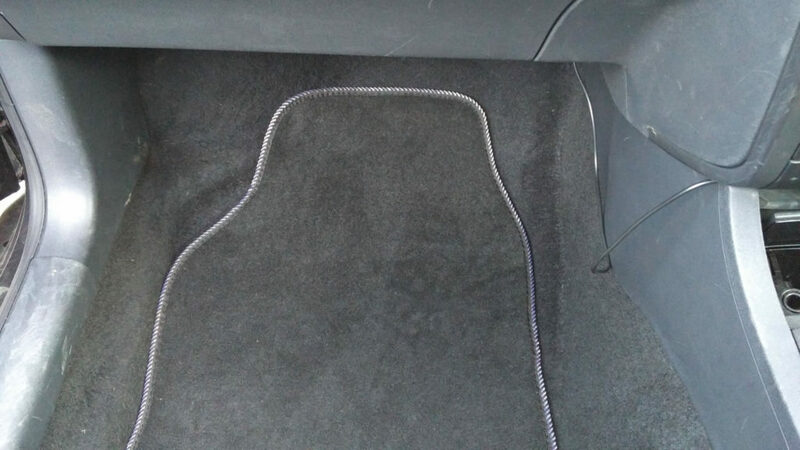 This method leaves more wire on display, but avoids the airbag issue. Now you should open the door, and bring the wire down the side of the dashboard, keeping it tight. Some vehicles have panels and hooks at the side, allowing you to tuck the wire underneath. If you would like, you can use some tape on the side to keep everything neat, as this will not be visible when the door is closed. Make sure the wire isn’t going to be damaged when the door is shut. From here we have two choices. 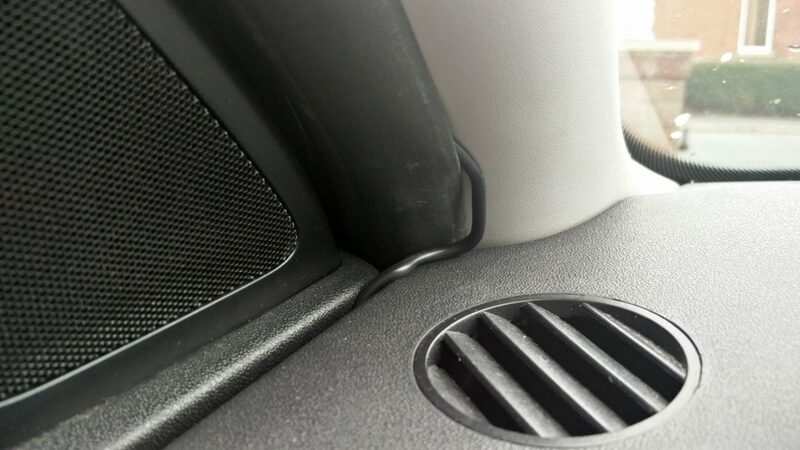 First, you can plug the wire into the cigarette lighter socket, and tuck the rest of the wire underneath the floor mat. This avoids any tripping hazards, and leaves only a little bit of wire on display. This is the method I use most of the time for my own vehicles, as it is the quickest and easiest. 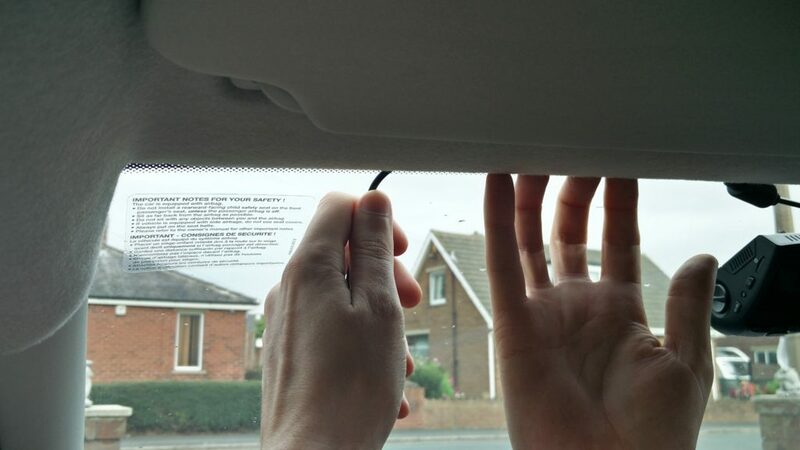 The second method makes use of cable mounting clips, and requires taking the wire above or underneath the glove box. This can often result in a neater finish, but will be more time consuming. It can also leave you with a lot of loose wire, which can be difficult to tuck away in some vehicles. When taking the wire underneath the glove box, look for any holes where you can tuck away this excess wire, and use tape to keep it in place. Use cable mounting clips to keep this wire tight, leaving only a small amount to plug into the 12V socket. For a neater finish, you can stick one mount by the door side and another on the center panel, to keep everything tight. Here is the finish you can expect. As you can see below, only a little bit of cable is on display. If you are up for the challenge, hardwiring the dash cam will usually hide the entire cable. Just make sure to read instructions carefully, or get a professional to help you.